This blog is written by a guy in New York City who splits his time unevenly between molecular biology, music, birds, and ranting. Well, mostly ranting. Every time there's a terrorist attack or even a threat, conservatives come out of the woodwork to explain to us how we have to trade a little bit of liberty for a little bit of security. They usually quote the most famous words never said by Abraham Lincoln: "the constitution is not a suicide pact", referring to Lincoln's suspension of habeus corpus during the U.S. Civil War. So where are these same conservatives when a lunatic exercises his unlimited Second Amendment right to bear arms and slaughters 32 innocent people? Presumably they're arguing that we have to trade a little bit of the right to bear arms for a little bit of security, right? That's what I said when the new Republican governor of Florida, Charlie Crist, announced that he was seeking to automatically restore the voting rights of all felons who have completed their sentences. Ex-felons are not a traditional Republican voting bloc, and doing anything that can conceivably be seen as deferential to criminals doesn't win you praise in the Republican party. For an example of the typical Republican commitment to voting rights, check out this disgraceful effort. But Crist decided to restore the vote to ex-felons, he says, "because it's the right thing to do". My cynicism radar is up, but if he's sincere then I'll give credit where credit is due. Kudos, Charlie. The barn owl nestbox cam in Benicia, California is up and running and the owls are currently feeding two hatchlings and incubating five other eggs. This cam is in color (during the daytime) with very high resolution and also includes audio, so the effect is quite overwhelming, especially when watching the female tear apart a prey item to feed to the chicks. 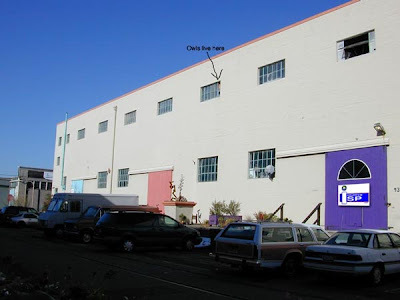 Below is a picture of the unassuming building where the nest is located and here's a link to more info about the nest site from the artist dudes who maintain it. Awesome.